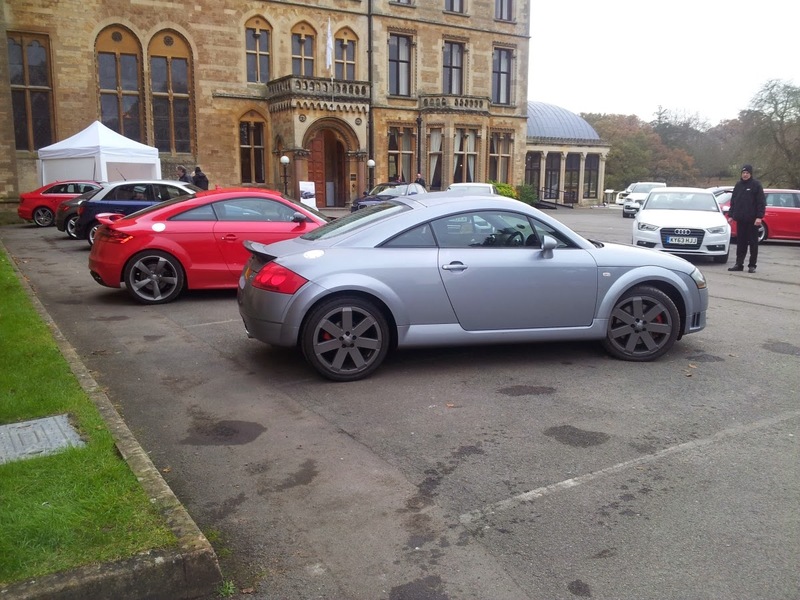 The Audi TT was launched in 1998. 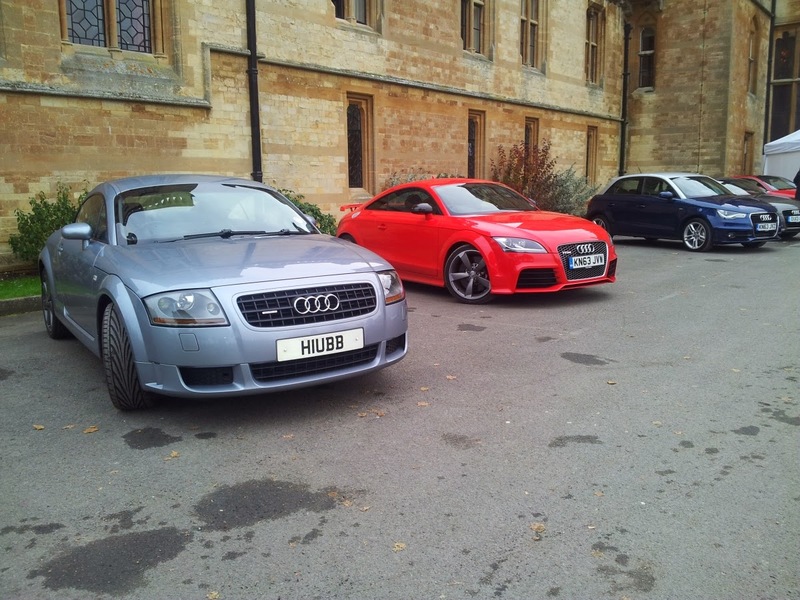 The dynamics were fairly neutral and improved through its model life to a peak in the 3.2 V6 Quattro. There was a 240 Sport model released in 2005 but it was a strict 2 seater so lost some of the practicality and user appeal of the base 2+2 car. Emissions, pedestrian safety and new technology demands meant that the model had to be replaced and in 2006 the Mk 2 was released. The RS is the ultimate Mk2 model to date, so how does it fare again the Mk1 3.2 V6? The Mk1 TT was a massive success and many were bought purely on the futuristic and curvy looks. It even looks fantastic today when compared against modern machinery. The blend of smooth sweeping bodywork with compact dimensions and a low roof was an overnight success for Audi. In V6 form it adds a deeper front airdam, a chunky rear spoiler and some V6 specific 7 spoke alloys to create a more charismatic look. For the Mk2 the body is sleeker and roomier inside but the original's concept car looks were dumbed down and are just not as striking as the original. It is 157mm longer, 78mm wider and 6mm taller than the Mk1 although the RS's 10mm suspension drop meant it is 4mm lower. The ever increasing trend towards taller side panels and slimmer side glass height areas has added vast amounts of bodywork to the side of the Mk2 TT. To counter this the designers added a kink toward the bottom of the door to break it up, which has added some fuss to the overall shape. The RS benefits from larger front airdams, deeper side skirts, recessed rear diffuser, carbon fibre mirrors and a large fixed rear spoiler to add some aggression to the standard TT body. The wheels are open spoke two tone 19 inch alloys which suit the more modern lines of the car. Overall the Mk1 is the better looking of the two TT's, the modern diluted shape of the Mk2 has lost some of its mojo in evolution. The original shape is so iconic its looks should have just been tweaked like Porsche have done to the 911 over the years. The Mk1 looks as good on the inside as it does the outside. The design and choice of materials was spot on. The carpets have a kind of office carpet weave to them and the scattering of the dimpled rings around the dash and fold down aluminium radio cover looks superb. The seats also look good, both the chunky rear individual scoops and the front sports seats. Trimmed in high quality leather they complete the concept aura and have the best seat heaters I have ever experienced, which are adjusted by old school analogue rotary dials. They could offer more lateral support for the corner speeds that can be achieved in this grippy four wheel drive car. Interior packaging is a little mean, there's sufficient room up front (and importantly the seats can be lowered sufficiently) but there's no place for an adult in the rear, even in an emergency, but kids do love the cosiness back there. The later car is a little blander, more grown up inside as it was made for a wider market but to be fair the MK1 was a hard act to follow. There's a little more space in here, less cosy but also less claustrophobic and the rear seats are slightly bigger so can seat kids a little older, maybe 10-11 years old. It's nice to see a conventional key and handbrake in a modern car and even the seats are manually adjusted to save a little weight. 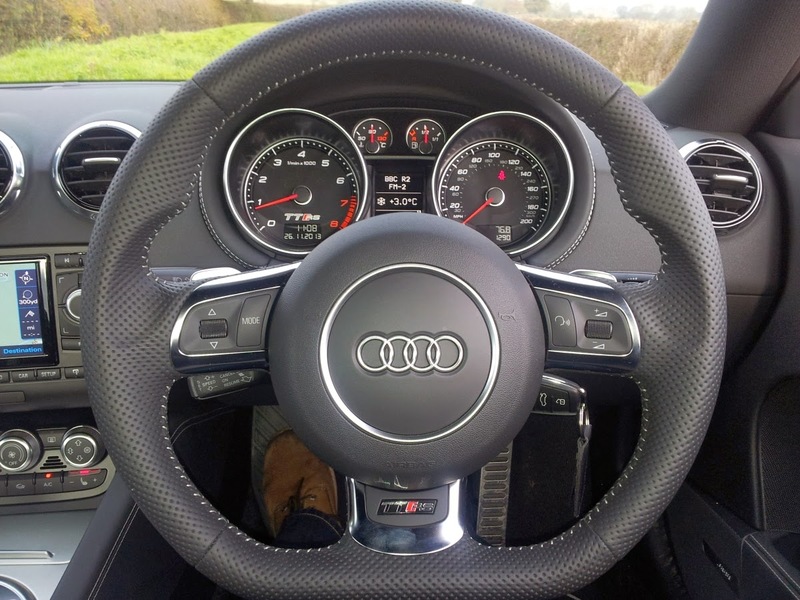 The steering wheel has a better feel in your hands in the RS as it's slightly thicker, more sculptured and features a flat bottom just like the R8's. The large screen Sat Nav is well positioned in the centre console and the clocks are nicely angled toward the driver, but the dash has lost some character. Yes it is more functional and easier to operate but the drama has been lost from the earlier car. The seats are trimmed in soft quality leather and silver stitching helps lift the ambience but again they do not offer enough side support for the performance on offer. They have better lateral support than the earlier car but as you'll find out the dynamics are on another level. The accountants must have had a greater influence over the designers in the development of the Mk2 as it has lost some of that kudos, that form that made the Mk1 just so right. The later car does have all mod cons but it just isn't as wowing as the original. The 3.2 litre engine in the Mk1 is a narrow angle V6 which fits nicely in the little engine bay of the MK4 Golf chassis. It's a hearty, characterful lump that makes a glorious growl when revved and is smooth all the way to the redline. It revs relatively slowly but you can feel every one of its 247 bhp when at full throttle. Overtakes are simple, no turbo lag to get past, just drop it into the right gear and you are past with minimum fuss. The ace card is the sound it makes as it has a bypass valve on the silencers (permanently bypassed in this one) so you can really hear the 6 cylinders making their presence known which makes driving the car at any speed an experience. It is a heavy lump and its weight can be felt when pressing on, despite the battery being relocated to the boot in the V6 for better weight distribution. The manual gearbox has a sweet but clunky mechanical shift action and is a joy to use, the downside though is that it has low gearing so in 6th at 70mph it's revving at 3,500 rpm which can be tiring on long journeys. A consequence of the glorious noise you tend to use more revs and hold onto lower gears waiting for the overtake, with the heavy weight of engine it translates to fairly mediocre fuel economy with circa 25mpg being the norm. 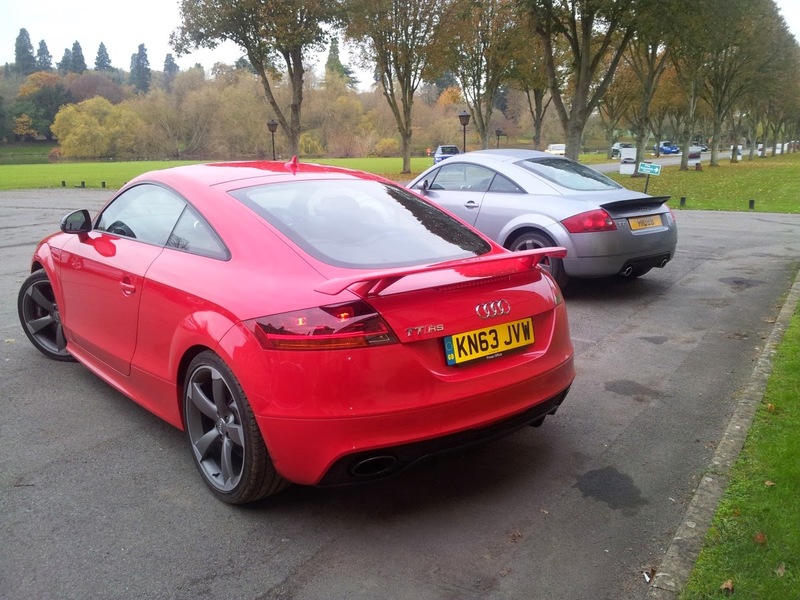 The TT RS uses a smaller 2.5 litre inline 5 with a single turbo to keeps the Co2 nannies at bay. The payback is big performance gains against the larger, older unit as that turbo keeps things perked up so when called for it has some serious firepower for a little TT. At full chat it will hit 62mph in 4.1 seconds - compare this to a new 911 C4S (4.5s) and a Jaguar F-Type 5.0 S (4.3) and that's an unbelievable figure. Part of this is due to the renowned twin clutch gearbox with pretty much immediate and neck snapping gearshifts. The soundtrack takes me back to that of the original Audi Quattro UR (which co-incidentally had exactly the same layout) being an imbalanced warble as the odd number of cylinders fight against each other for attention. There is a slightly delay when you demand more power as the turbo picks up boost but you are rewarded with a rapidly increasing rev counter and some insane speeds so you only have to think overtake and it's happened. With all this power and a self-shifting gearbox it's very easy to drive fast so whilst you feel a bit of a driving god your licence may not thank you. The added advantage of the modern high output turbo motor is that when you have had your adrenalin hit you can switch to a more sedate engine map (which in the RS also backs off the gear change severity) turning it into a calm and relaxed car capable car of delivering 33mpg. There isn't really any contest here, yes the original had a characterful growling V6 and an enjoyable drive but the younger car has an pseudo 80’s Quattro warbling soundtrack, enough power to sink a battleship and 21st century fuel economy. When the Mk1 was launched it was considered too sharp and after some serious high speed crashes Audi made a series of changes to the chassis to dumb it down and make it less twitchy. They went slightly too far so it's a very safe predictable car and, with four wheel drive, totally unflappable. The Haldex based system sends 90% to the front wheels and 10% to the rear (to keep the rear diff pre tensioned so it has faster locking times) and when it senses front wheel slip it clamps down on a clutch in the drivetrain to send power to the rear wheels. On the road the car feels just like a grippy front wheel driver but with no torque steer so when pushing on feels front heavy and runs wide in the corners. The suspension is relatively softly sprung and well damped so is comfortable but does have a little roll when pushing hard. This example has had modified lower arms (poly bushes and a metal sleeve to reduce the bushing) to put some accuracy in the steering which makes it much more agile and sharper on the road. The brakes on the V6 have larger 280mm discs at the front but with only 2 pot calipers are nothing to write home about, but do stop the car without fuss. Overall it's more of a GT set up than sports car but still capable of holding it’s own down a wet country road hence the reason I bought this very car. The RS has the same Haldex-based Quattro drivetrain but has an extra 10 years development time and so its weighting and bias feel more grown up than the earlier car. In addition the suspension is bang up to date with magnetic dampers and liberal use of aluminium reducing the unsprung weight so there is much better wheel control. Selectable damping means pliant to planted at the touch of a button so it has the best of both worlds. The wheels have grown an inch to 19 inch and are fitted with 255/35/19 Toyos which put considerably more rubber on the road than the Mk1 V6's 225/40/18's. Out on the road and it's still heavy at the front so understeers during heavy cornering but slightly less so than the earlier car due to being 15kg lighter. The loss appears to be at the front end owing to one less cylinder and the liberal use of aluminium. It only sends 2.5% of the power to the rear in normal use but can transmit up to 100% backwards in an instant, responding much faster than the old system. Rather than feeling like a secure front driver it feels very much 50/50 driven so whilst not as playful as a Boxster it is ultimately dependable meaning you can drive at 100% without breaking a sweat. At higher speeds it is more stable than the earlier car due to the better aero and the additional downforce generated from the large fixed rear wing. The swap from hydraulic to electric power steering has meant it's lost some feel and with the larger tyres there's little to tell you what's going on in the front arches. The brakes are a mighty set up with 370mm steel front discs and 4 pot calipers with great feel and modulation so are more than a match for the potent motor. In application the chassis is brilliant, the Quattro set up is not that playful but it is very confidence inspiring so when driven hard the mix of high power and all wheel drive permits a little sideways but safe action on full power exits from roundabouts and low speed corners. Just like the engine and gearbox result the chassis is a world ahead of the old car, with serious braking and switchable magnetic damping it's a brilliantly workable setup. The older car just can't compete and while it's a good handler and feelsome experience it's out of its league in the presence of the new car. These are both great cars and it's slightly unfair to compare the dynamics of a 12 year old car to a top of its game brand new one. The RS is nearly twice the list price of the V6 when new but it does have massively more power and the chassis to keep it in check. I still prefer the looks of the original and think Audi should have just evolved the shape, but what's done is done. Hopefully they will make the Mk3 a little more charismatic. On the inside the earlier car has the more iconic interior but the later car has slightly more space, more refinement and more toys. The Mk1 V6 is fairly old school – a manual gearbox, an aural treat from the exhaust and a little roll in the corners so you have lots of fun at licence friendly speeds. The Mk2 RS is bonkers fast but is a little clinical and more of a point and squirt machine with electronics controlling most functions. Yes the older car has an analogue feel which is a dying art but modern technology and engineering just works so much better being faster, more efficient, comfier yet more stable. The Mk2 shines through as the overall winner but the older car can hold its head up high as it's the one that will be savoured most in the future.